Made of high quality, weather-resistant stainless steel, this ultra-handy accessory with its dual spring gates will hold, secure, and connect everything from keys to water bottles to gear. 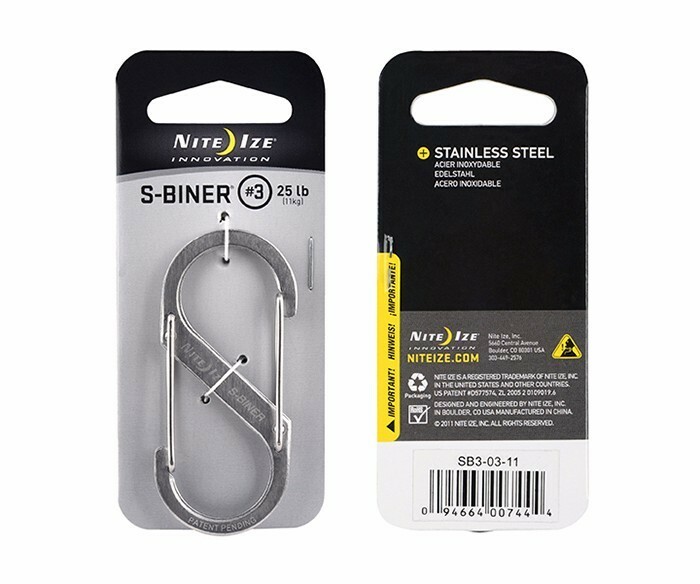 Smaller-sized S-Biners® are excellent for connecting two zipper sliders on backpacks, duffels, and suitcases. We know that one size doesn&apos;t fit all, so we&apos;ve designed six different sizes so you can choose the right size for the task at hand. We&apos;ve found that the smaller sizes work great for hanging smaller items from a purse or backpack strap, attaching to individual keys, or hanging a plant from a ceiling hook. The larger sizes work great for bigger jobs like hanging a paint can from a ladder or a tool to your tool belt. But, the list goes on and on. We think Backpacker Magazine said it best when they wrote "Don&apos;t ask yourself if you need this useful little widget. The question is: how many?"